Do women run their businesses better than men? 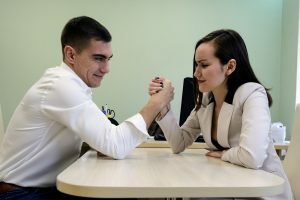 In a classic “battle of the sexes” argument at Zooconomics.co.uk HQ our team were debating whether men were better at running businesses than women. We were interested to find out and after side bets were laid in the office we set about digging up some concrete evidence to settle the argument. We looked at a sample of companies that were 21 months old and using Companies House data and identified businesses that had all male and all female owners. When a UK limited company is registered it will need to file an annual confirmation statement after 12 months with Companies House. 9 months later (when the company is 21 months old) the company should have also filed their 1st set of accounts if the business has traded or dormant company accounts if the business has still not started. In the companies that we looked at we found that female run businesses were more likely to have filed their returns on time. It’s really easy to miss a filing deadline if you do all the work yourself without the help of an accountant. Our online accountancy packages are designed to make sure that you never miss a deadline. We offer low fixed monthly fees and help take care of small business payroll, VAT and filing of annual accounts. We provide you with easy to use bookkeeping software so that you can take care of keeping your financial records in order, or we can even do your bookkeeping for you.